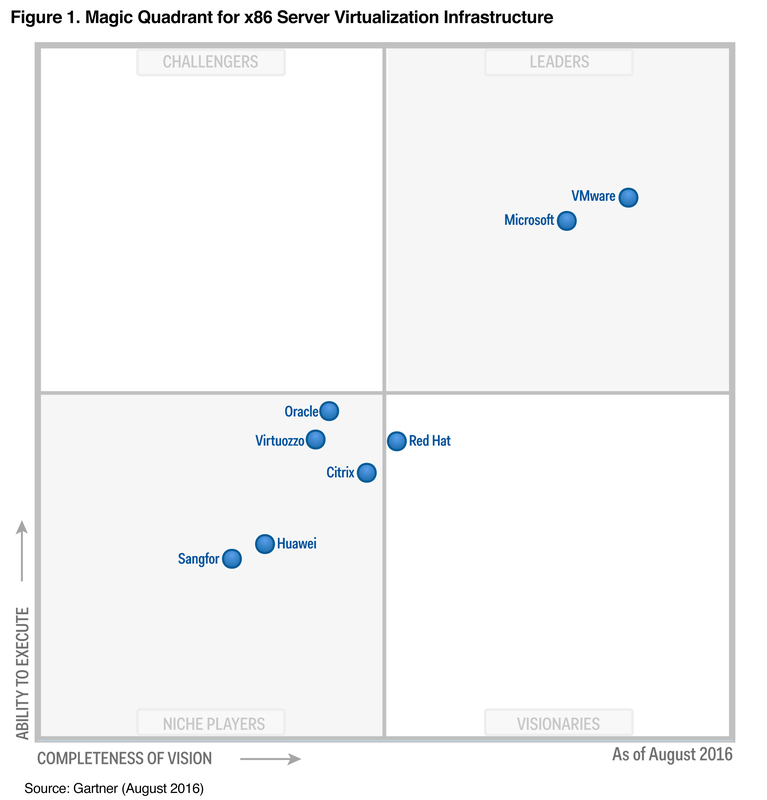 I am proud to announce that Red Hat Enterprise Virtualization has been named a "Visionary" in the 2016 Gartner Magic Quadrant for x86 Server Virtualization Infrastructure. We believe that our positioning highlights Red Hat’s ability to deliver an integrated virtualization solution that is tightly coupled with Red Hat Enterprise Linux and complementary cloud technologies including Red Hat OpenStack Platform. Our vision is to enable IT organizations to deploy solutions that help drive innovation throughout the entire stack, from traditional virtualization to cloud-enabled workloads. As Red Hat Enterprise Virtualization is built on the KVM hypervisor, we are excited about our continued investments in the KVM hypervisor ecosystem and our contributions in the community, including the great work done by our engineers. Red Hat authors 60% of the code accepted into the KVM hypervisor*, and employs many of the maintainers and core contributors. These contributions into the core enablement technology helped fuel Red Hat’s growth in both Red Hat Enterprise Virtualization and Red Hat OpenStack Platform during our most recently completed fiscal year. Red Hat Enterprise Virtualization’s adoption illustrates a fundamental shift in the market where we see customers saying "enough" when having to re-negotiate license agreements with their existing proprietary solution vendors. Ongoing market and vendor consolidation challenges customer expectations of their future datacenter strategies. Red Hat Enterprise Virtualization establishes an open base that can prevent future lock-in so these organizations can adopt the proper technologies and platforms based on their datacenter modernization objectives. Building on a long history of involvement in virtualization, starting with our contributions to KVM technology in 2009, and the initial commercial product launch in 2010, Red Hat Enterprise Virtualization has built a strong global customer base, including the likes of Bonhams, Cox Automotive, and Dreamworks Animation. We are proud to empower them with a virtualization solution that provides a scalable, more secure, and high performance infrastructure at a better value than proprietary solutions without the difficulties of vendor lock-in. Red Hat Enterprise Virtualization helps them to build a foundation for future technologies while integrating with existing technologies. Low-latency computing environments such as those found in the financial services industry that run trading applications that often require response times tracked in terms of microseconds. Download the 2016 Gartner Magic Quadrant for x86 Server Virtualization Infrastructure report and visit the Red Hat Enterprise Virtualization product page for the latest updates. *Commits to the KVM (x86), QEMU and libvirt open source projects between July 2015 and July 2016.